BookLust: The Stuff of Dreams. But in real life, not in Dreams. The Stuff of Dreams. But in real life, not in Dreams. 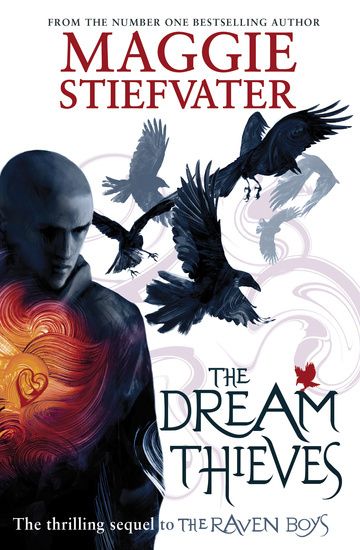 The Dream Thieves is the second book in Maggie Stiefvater's Raven Boys series. Surprisingly, I enjoyed this book more than The Raven Boys, even though it's in the middle of the series. I think this is mostly because each character finally has a distinct personality, and the focus is on the two characters that interest me more than any of the others, Adam and Ronan. Adam! Ronan! Those two are so intense and are at that point in their lives where things can go in so many directions and so they make some really horrible decisions but some brilliant ones and sometimes they are jerks and sometimes they are sweethearts, and I just loved it. Adam has so many personal demons, growing up unloved and trying to be a better person than everyone around him. His struggle not to become like his father is so painful to watch, and you cannot help but want him to win REALLY BIG in the lottery of life because he works so hard to deserve it. Ronan is a completely different kettle of fish. I don't know if I understand him much better now than I did before, but I like him, and I liked being in his head. He certainly doesn't waste words or time or space on anyone he deems unworthy, but he is willing to go deep-sea-diving without an oxygen tank for those he loves. There was this scene when he realized that he didn't have to steal things but could just ask for them and people would be generous enough and love him enough to give them to him, and that was just great. And his whole development as a rough guy into someone with moments of generosity and kindness - it's great. I mean, Gansey and Blue are fine, but they seem likely to descend into doomed lovers mode shortly, and I don't think that will appeal to me. Of course, I thought that would happen in the first book, and it didn't, so perhaps Stiefvater will pull through for me again. I am not sure what all I can say about this book as it is the second in a series. Suffice it to say, the plot moves forward, and in very compelling ways. We get more backstory on all of the characters, and we even meet a new one, Mr. Gray, who was one of my favorites. Honestly, Maggie Stiefvater, I feel like you do not get enough credit for writing Mr. Gray so well because people are so obsessed with the Raven Boys themselves, but I found Mr. Gray's development fascinating, and I loved spending time inside his head. That a hit man (not really giving much away here, we know this very quickly in the book) could be given so much depth and that you can have compassion for a character who is both terrifying and suffering from his own internal angst and fear is just glorious. I have gone on at length about the characters, and that is probably because I feel like I lost track of the plot a bit in this book. I am not *quite* sure where we are going, but I trust Stiefvater to get us there in an exciting and unexpected fashion. You've got a great point about Mr. Gray. I really liked his character development, but I haven't talked to people about it because there is so much more to talk about when it comes to the boys and Blue. Stiefvater is so great with "middle" books! And yes, love Ronan! Yes to all of this, especially your comments on Mr. Gray. He was one of my favourite parts. Can. Not. Wait. for Blue Lily Lily Blue. And I so agree about Adam and Ronan in this book -- they are the best. When Adam and Ronan have each other's back, that is my absolute favorite thing. Because you know, they are not affiliated with each other really -- they are actually both affiliated with Gansey. And they are not care-taking people, either of them. So I feel exceptionally heartwarmed when they take care of each other. I don't have much to add to to this review except <3 and I'm so excited for Blue Lily, Lily Blue. I liked this better than the first one too and am really excited for the next one! Also, you're not kidding about Mr. Gray. He's a great character. My sister actually has a huge crush on him, which I think is testament to how well-rounded a character he is, given that my sister is a very nice person not usually drawn to the bad guys. I love this series and I'm just waiting for the next one to come out. I love the crushing between Mr. Gray and Blue's mom. I read this on a plane this summer, because of Jenny's repeated urgings, and now I am waiting for the third one. If I'd known I would be waiting for the third one so anxiously I might have waited to read the first two!